After having our first daughter, we almost assumed our second child would be a boy. Then we had another beautiful daughter. We were delighted she was healthy but obviously slightly disappointed that we were not going to have a son, and it was likely my husband’s family name would end with him. We decided nearly 3 years later we would try for one more baby but that if there were any chance of increasing the odds for a boy we would like to try. We purchased several books and followed them to the word and nine months later we had our third gorgeous baby girl. 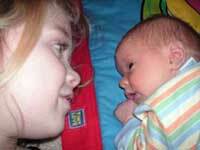 So, 6 years later when we decided to have just one more baby and looked around for ways of enhancing the possibility of getting a boy, and we found you. We used your GenSelect Baby Boy Home Kit and are now proud parents of a handsome little boy named Oscar (8lbs. 4oz.). We now feel our family is complete and you’ve given us something we thought we would never have. We can’t thank you enough and have recommended you to many. When people say “Oh, a boy! Isn’t that lucky after 3 girls,” we tell them it wasn’t luck, it was GenSelect. I don’t normally do such things as I am quite possibly one of the world’s most fickle consumers – in my prior life I was a litigation attorney for the Illinois Attorney General’s office specializing in Consumer Fraud. Thus something along the lines of gender selection – presumably an inexact science – is something I’d have been skeptical of by nature. In our family, my parents first six grandchildren were daughters. My wife an I have a beautiful daughter, but wanted a son to make our family complete. For Christmas last year (2004), I gave my wife the genselect “boy” kit. 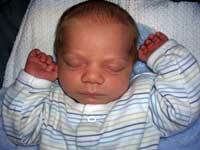 And on Christmas Day, 2005, we brought our son, Jonathan home! (See attached photo). Boy were the grandparents excited! Thanks again. I’m a believer. My name is Veronica M. I am currently 17 weeks pregnant with a GIRL!!!!! My husband & I couldn’t be any happier. I purchased your product with much hesitation, yet felt what the hay, I’ll give it a try. Well, there hasn’t been a girl conceived on either side of our family for 4 generations on my husbands side and 32 years (since myself) on my side. She is VERY loved already. I want to thank you for the wonderful information and products. I am a believer and will be telling ALL my friends about it. We always dreamed of having a boy and a girl, so when we decided to get pregnant again after already having a wonderful, healthy son, we wanted to try for a baby girl. I heard about GenSelect from a friend who had a baby boy after three daughters in a row. They were convinced they’d always have girls, but decided to try one more time using your Boy Kit. Wow, was she excited after that first sonogram that showed they were having a son! We checked out your website and read about how it was all-natural and even guaranteed. Plus, it fit our budget and we could do it at home! So, we decided to buy a GenSelect Girl Kit. Today our beautiful baby girl says “hello, world!” (Actually, she just gurgles right now.) She was born in February, and we’re convinced that GenSelect helped us have the daughter we wanted so much. Thanks so much from our whole family. We have a generous 30 day refund policy. For refunds to your visa or mastercard please contact our merchant services provider: ProcessUSA.